A dry basement is a good basement. We can help you keep your basement dry with a TripleSafe® Sump Pump System (shown here), combined with a SaniDry® dehumidifier. A damp or wet basement is every homeowner's worst nightmare and can lead to a variety of problems from musty smells to mold. Woodford Bros., Inc. is here to help by providing the best basement waterproofing solutions available. Our expert waterproofers will identify the cause of your issue and then provide the solution that can best eliminate the problem. Do you have a basement that floods or leaks? 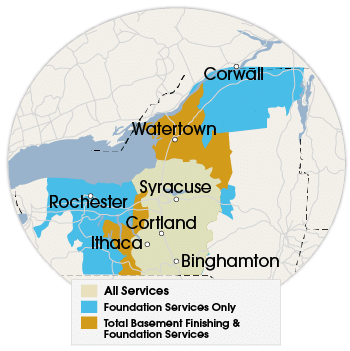 Contact us today online or by calling 1-855-203-6835 to schedule your free basement waterproofing cost estimate in Syracuse, Binghamton, Utica, Rochester, and the surrounding areas in New York! Many people think that heavy rains and obvious standing water are the main causes of a wet basement. However, you can actually have water issues without any of the prior problems. While it's easy enough to see the problem when water is entering your basement, the real cause can be harder to identify. When you foundation and basement is put into place, the area around it is filled in with replacement soil. However, because this soil is relatively new, it is far less dense and tightly packed than the soil that was never touched. This makes it easier for water to flow through this soil and therefore it collects in this area, putting pressure on foundation walls and causing cracks. The more water in the soil around your home, the more that soil will want to expand. However, there is only so much room and therefore it will have to try to expand into your foundation, putting pressure on it. The water will then work its way through any opening available, including cracks and openings around pipes or windows. Locally-owned and operated company: Woodford Bros., Inc. is the locally owned and operated member of the Basement Systems network. We have products and training that simply can't be beat! We pride ourselves on experienced crews of waterproofing experts who've seen it all and know how to fix every type of leaky basement. At Woodford Bros., Inc. we know just what it takes to keep your basement dry all the time! Do you have a leaky basement, flooded basement, mold, mildew, or a musty smell? Don't wait and let the problem get worse. Give your local expert waterproofers at Woodford Bros., Inc. a call at 1-855-203-6835 or contact us online today! We offer free basement waterproofing cost estimates in Syracuse, Binghamton, Utica, Rochester, Liverpool, Ithaca, Rome, Elmira, Endicott, Auburn, Watertown, and the surrounding area. When you call you can count on our specialists to quickly visit your home and provide a thorough inspection.